Tuesday, 12 February 2019, 2:50p.m. A shocking hit-and-run incident at a South Auckland Mobil station on Monday night allegedly started over a right of way. Just before 9pm last night a driver was caught on camera running down a man and then crashing into a parked car of the forecourt at a Manurewa Mobil service station. Footage shows the driver putting his car into drive and speeding into a man, sending him flying before attempting to flee the scene. A witness, and friend of the man run over, said the argument began over right of way when entering the fuel station. 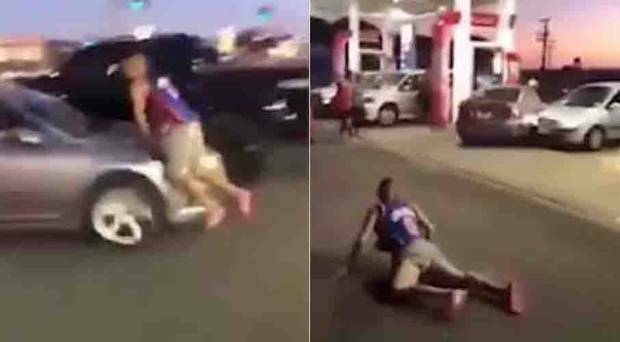 The man who was run over in the video had been heading to the Mobil to get some drinks after he had been called out to tow a friend who had run out of gas. At the main road intersection to the gas station the man and his friends waited for another vehicle to turn, but after some time it did not move, the witness said. "He was just going to get some Powerades. They were both trying to pull into the gas stations, they were both on the main road, the offender had right of way." Then they both turned at the same time and crashed. The two parties began exchanging words before a racist remark was made and then what in seen in the video unfolds. The man driving the car in the video had a bottle of gin in the driver's side footbay and was visibly drunk, the witness said. Another witness told the Herald the fight kicked off when the men towing the car asked the other man to move his car following the collision. "The white guy was blocking the entrance to the petrol station for the young fellas who had their car towed. "The guys jumped out and asked the white guy if he could move to let them in, but he wouldn't move and that's when the driver started shouting 'you dirty n*****s' and shouting racist abuse then a fight broke out. "The two guys went to confront the driver and then the driver threw a punch and it was all on. "The young fella then hooked him in the mouth and left him with a bloodied face. "Some other guys started jumping in and I started shouting 'get off him, get off him'. After they got off him the white guy got into his car and hit one of the guys before trying to drive off." The witness told the Herald the man's car stalled as he turned the corner and crashed into another car on the road during his attempted getaway. Police Inspector Adam Pyne told the Herald they were called to the altercation between a man and a group of people at the petrol station. He said the driver who hit the man with his vehicle was taken into custody. "Police are making enquiries and will review CCTV footage to try to build a fuller picture of the events leading up to the incident," Pyne told the Herald. "Anyone who may have witnessed what happened prior to the incident, or anyone with footage of the entire incident, is urged to contact Counties Manukau Station on (09) 261 1300."